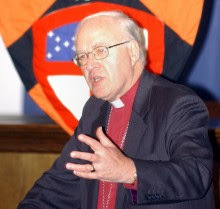 Replying to questions on a BBC TV programme today, Lord Carey of Clifton, the former Archbishop of Canterbury, has publicly agreed with the Christian think-tank Ekklesia that it is time for Britain's archaic blasphemy law to be abolished. Lord Carey, who is an outspoken conservative evangelical within the Church of England, was responding to comments by Ekklesia co-director Jonathan Bartley on a discussion about blasphemy on BBC1's Sunday morning current affairs and religion programme, 'The Big Questions'. The ex-Archbishop protested against what he said was an increase in "offensive" material about Christianity in the public domain, including 'Jerry Springer - The Opera', over which Stephen Green of Christian Voice is trying to arraign the BBC in a private prosecution. But Lord Carey said that Christ told his followers to put away their swords and did not seek to defend faith by force. Bartley said that a blasphemy law was itself blasphemous from a theological viewpoint, because it suggested that the transcendent God somehow needed human laws for protection. Ekklesia has also pointed out that Christ faced an accusation of blasphemy at the trial that led to his death, and a Christian dramatist on the show said that many of Jesus' stories and comments caused great offence in his day. Blasphemy as a legal offence was backed by Tory MP Anne Widdecombe, a convert from Anglicanism to Catholicism, "so long as there is an Established Church in this country". Other supporters of blasphemy couched it in terms of a Christendom (church-state alliance) or theocratic approach. Ekklesia has argued that such views undermine a gospel of radical equality and humility rooted in the life of Christ. Author and scientist Richard Dawkins, a campaigning atheist, said that free speech was indivisible, and that charges of blasphemy leading to a fatwa for Salman Rushdie was obscene and had affected his life deeply. Doctor Who and Torchwood star John Barrowman, who was offered a part in the Jerry Springer musical, also backed free speech on religion, and called for acceptance of gay people by the churches. Author Mark Vernon, an Anglican turned agnostic whose latest book is 'After Atheism', talked on the TV show about the bizarre and traumatic experience of being investigated by the police for blasphemy over a controversial poem some years ago.